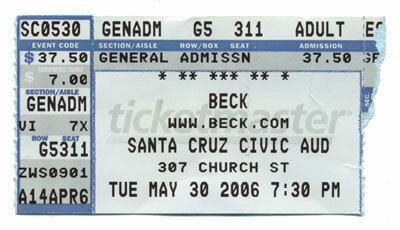 Two nights ago Steph and I headed down to Santa Cruz to see my favorite artist, Beck. He played a show in a small auditorium there, and Jamie Lidell opened for him. Overall, it was a really fun show. The venue was smallish. There were probably only 600 or so in attendance since not many more would fit in the room. It was an interesting change from the show in L.A. that Steph and I saw last summer. Warning: Beck spoilers. If you’re going to see Beck perform soon, you may want to stop reading and just let the show be a surprise. One of the big keys to this show (and I assume this leg of the tour) that really differentiated it from the last leg of the tour was… get ready… puppets. Yes, puppets. Or as Beck called them, “little friends.” The idea was that instead of using the video screen to show live video of the band members, the band would have a small puppet stage, on stage, with look-alike puppets of all the band members. The big video screen behind the band would show video of the puppets, being performed live by a crew of four puppeteers, mimicking the live performance as it happened. Including mouthing the lyrics, of course. The puppets even wore matching outfits to what the band members were currently wearing, and changed instruments appropriately. Thanks to Flickr, once again, you can see a blurry-but-passable shot of the stage, the mini-stage, and the video screen with puppets here. Check out that whole series. The irony was just hilarious. If I wanted to read into the deeper symbolism and metaphorical meaning behind this choice, I could. Or I could just enjoy the frickin’ show. I’ll let you guess which of those two choices I picked for the majority of the show. There was a section of the show where the deeper meaning was center stage, however. At one point in the show, Beck said, “We were working hard all day, but we heard the puppets got to go down to the beach, get some sun, and meet the locals. I guess we’re pretty much riding back seat to the puppets these days.” We all laughed, of course, until later in the show when all the music stopped, and a pre-edited video came on screen. It was the puppets, on the beach in Santa Cruz, and it was clear that the video was made specially for this show. They talked to the locals (with voice talent from their real-life archetypes). They rode the Boardwalk roller coaster. They threw up in the trash can. Everyone was laughing and cheering. Steph leaned over to me and, indicating the puppeteers, said, “Gee, you wouldn’t enjoy that job at all, would you?” Oh my goodness. Please. Then the show got stranger. The video montage brought the puppets back on stage, sans actual band and the puppets performed the first half of the song “Loser” alone, with piped-in accompaniment from the original recording. Really strange. But then the strangest moment happened. The band came back on stage and performed a song I’ve never heard before (possibly a new Beck song, since he performed several new ones that night). But two of the band members, including Beck, were wearing full-body bear suits. Beck (I presume, he never took off the head on stage) was wearing a growling bear head and a brown fuzzy body. The other bear was more teddy-ish, with a red ribbon around its neck and cute black eyes. Very surreal. I think everyone was pretty confused for the two or three minutes this went on. Then the bears left stage, the two regular band members came back out, and the show continued. Really weird. I guess if it wasn’t weird, it wouldn’t be Beck. Aside from all the gimmicks and visual fun, the music was just great. It’s all too rare that I get to crank up the volume and enjoy a rowdy crowd. But even if he’s not playing his harder stuff, I love it when he pulls out that slide guitar. The whole crowd gets excited. It’s such a unique sound, and he plays it extremely well. When he slowed down and played some solo Sea Change-era tunes, the crowd sang along. It was beautiful. And it was over too soon. Update: I found some much better photos of the show (or shows in the days directly surrounding ours), so check ’em out. There’s a great shot of human/puppet mirroring, an awesome puppet close-up (note now the puppet stage has a puppet stage on it), and another nice, clear shot showing Beck and the puppets. I’m sure searching around on Flickr would yield more, if you’re so inclined. Previous Post Email or Postal Mail? I’ve never seen beck in concert but have always wanted to. The chances of him coming to MN seem pretty remote though. Boo. Shoot… Checking his website for past tour schedules, I see he was here in Sept 2005. I guess I missed the boat there.